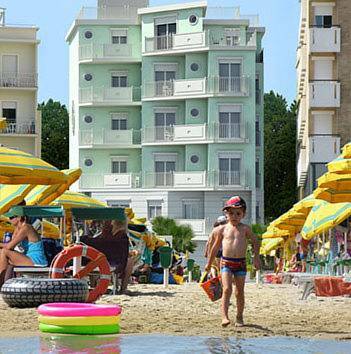 Beach Residence Gabicce Mare has an entrance hall with magnificent views and entrances from the beach and the promenade. 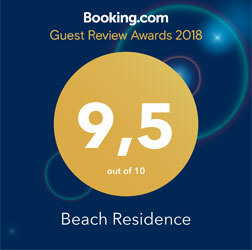 The location is ideal: you are at the beach! Various types of apartments are furnished tastefully and efficiently to offer our guests the best comfort, so you can feel comfortable on vacation. The entrance is equipped with electronic key, the furniture is completely new, the kitchen features multifunctional induction stove, microwave, fridge and freezer, and is equipped with dishes and pots. Gastronomy / Fruits and vegetables / Supermarket/ Pizzerias/ Bakery/ Takeaways/ Restaurants/ Bar/ Butcher’s shop/Fisch Schop/Tourist Information Office/Church/ Emergency Medical Service/ Pharmacy/ Bus stops for tours. Click on the different categories to learn more. You can also change some of your preferences. Please note that blocking certain types of cookies may affect your experience on our websites and the services we are able to offer.